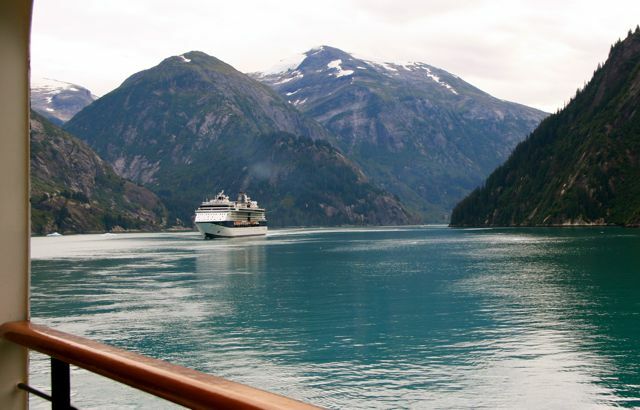 We sailed through the night and woke up docked in Skagway. 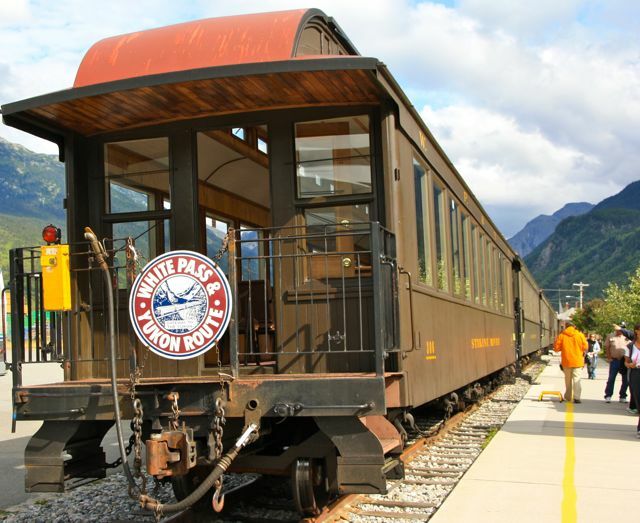 Bill is mad about trains, and after he saw a documentary on the White Pass Railway, it has been on his bucket list ever since. 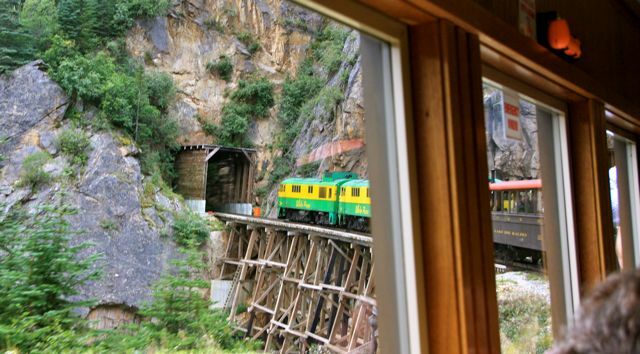 So when we were making choices for a shore excursion in Skagway it was obvious that we would do a train trip. 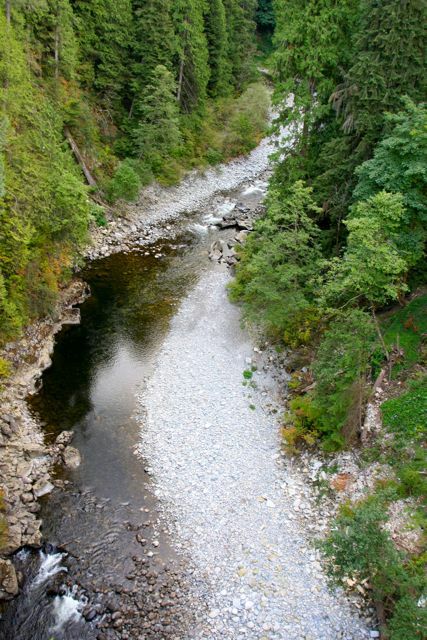 The White Pass Railway is an Historic International Civil Engineering Landmark. 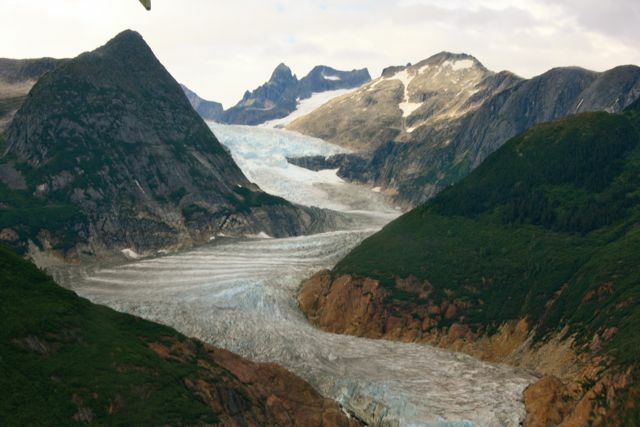 It was built in 1898 after Gold was discovered in huge quantities in the Yukon. The building of the 110 mile track was a challenge. 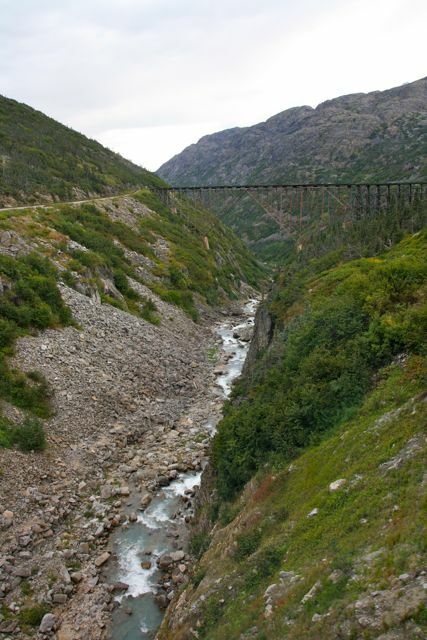 The railway climbs from sea level to 3000 ft to the Summit in 20 miles and features steep grades of 3.9%. Construction required cliff hanging turns, tunnels, bridges and trestles. Work on the tunnels took place in winter with temperatures as low as -60*. 35,000 men worked on the construction. Another train is following us up to the Summit. After the gold rush the railway was used for moving ores and concentrates. 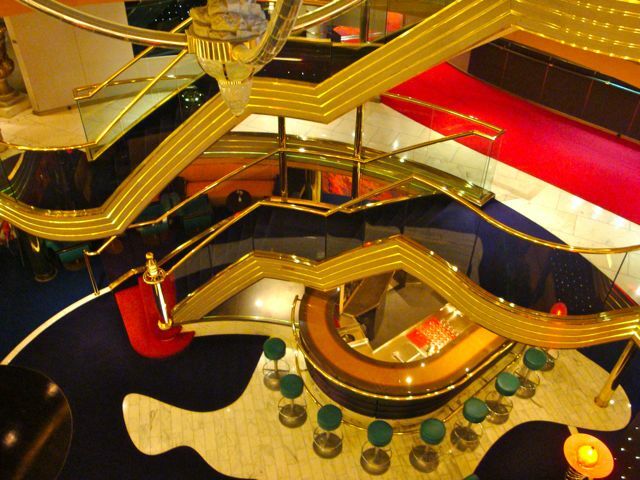 It pioneered the "Container Route", the movement of containers by ship, train and truck in 1955. This original trestle isn't used any more, we went over a newer bridge. 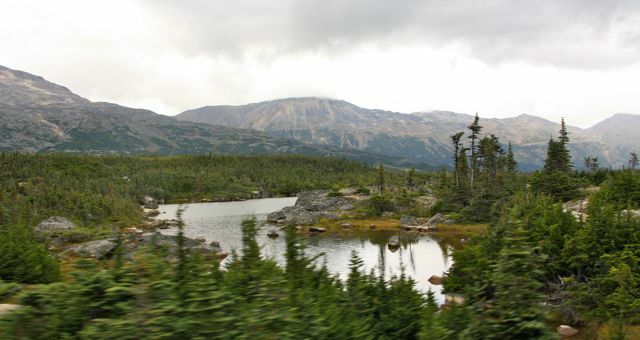 In 1988 the White Pass Railway &Yukon Route reinvented itself as a tourist attraction. At last we arrived at the summit after climbing up the most rugged mountains and over deep ravines. The scenery was stunning. 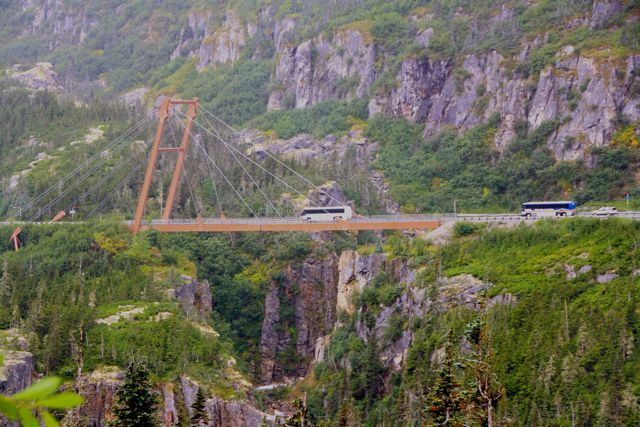 We continued on to the small town of Fraser in Canada and a customs officer came through the train to check our passports before we could alight and board a bus to take us back to Skagway. 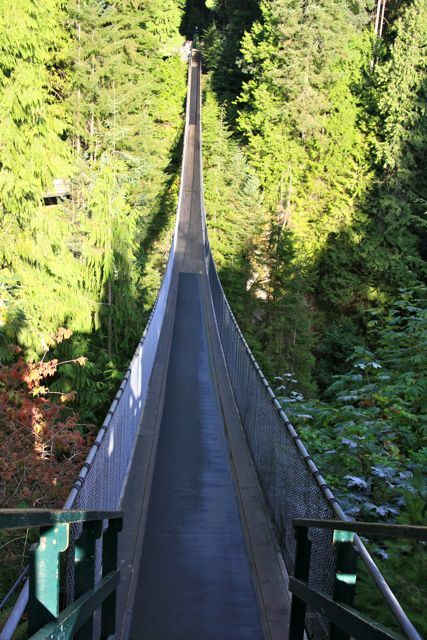 This is a special bridge built to withstand earthquakes, it is only supported and attached securely to one side of the ravine. Only one bus at a time is allowed on it. 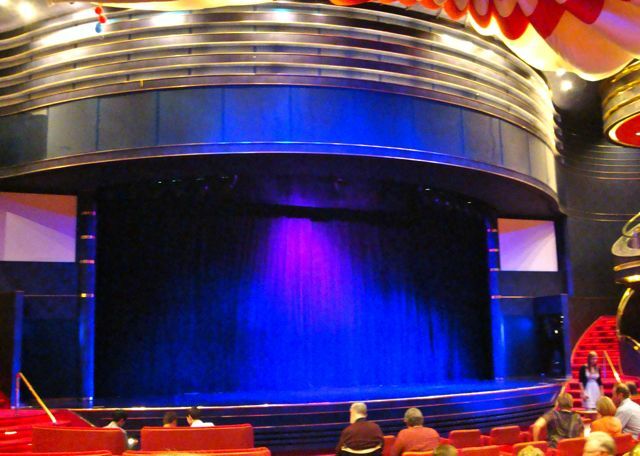 Soon we were back on board the ship at the end of another exciting adventure. To ride on the train yourself watch Bill's short video here. 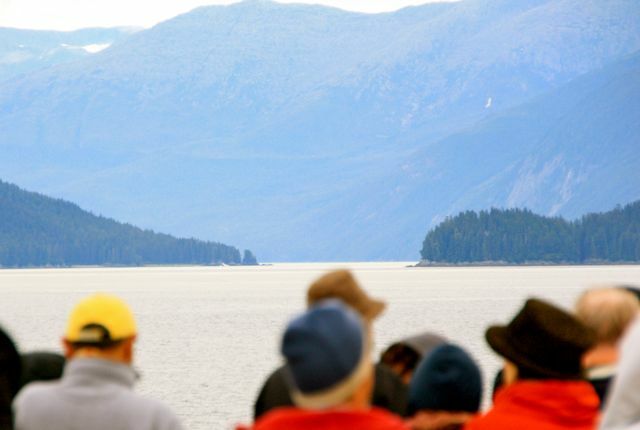 People often ask me which part of the Canada & Alaska trip did I like best. 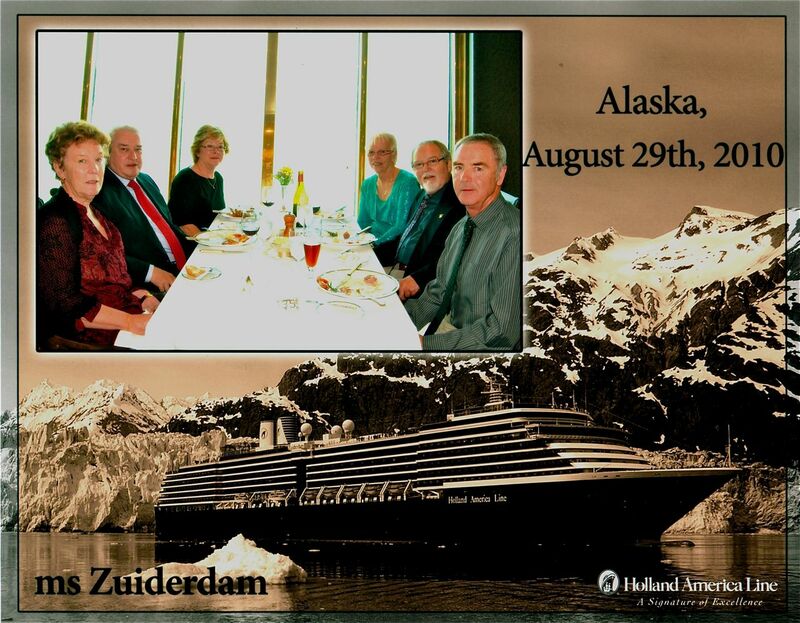 It is a hard question to answer as it was all fabulous but the shore excursion from Juneau was my favourite day. 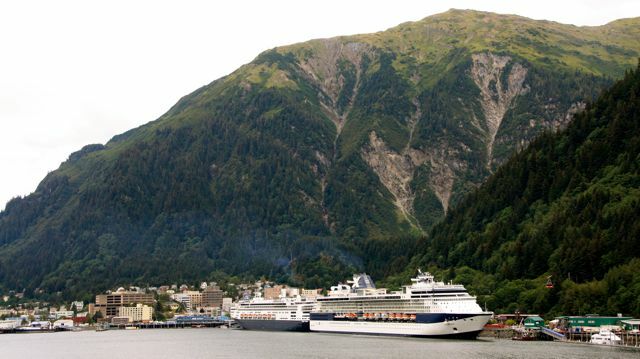 There are many shore excursions provided by Holland America (at an extra cost ) to choose from. 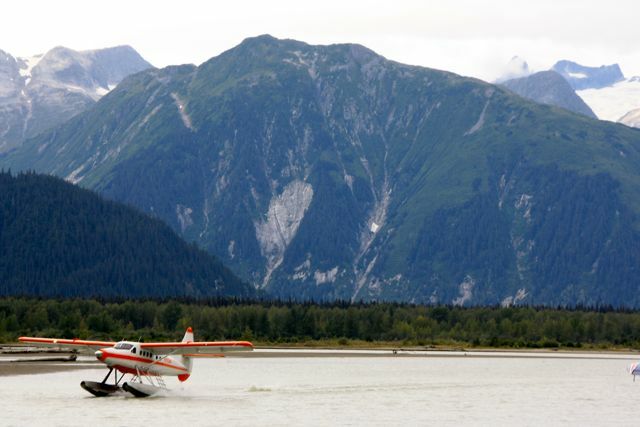 When I saw the one called "Wilderness Salmon Bake & Scenic Flight" I thought that it sounded like fun. 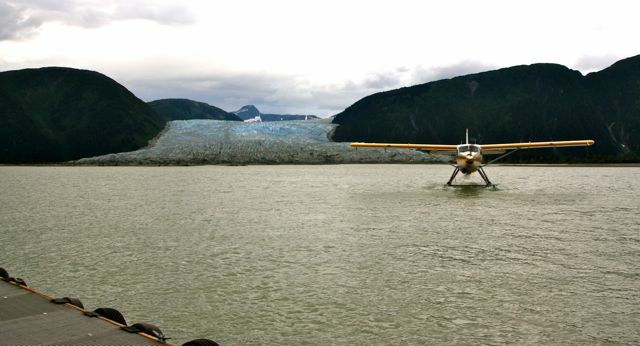 It included a float plane ride over glaciers, landing at Taku Lodge and partaking in a salmon feast before returning to Juneau and the ship. It was overcast and showery but it didn't stop us having a great time. The planes weren't far from the ships. We flew over fjords, rivers and glaciers in between mountains. 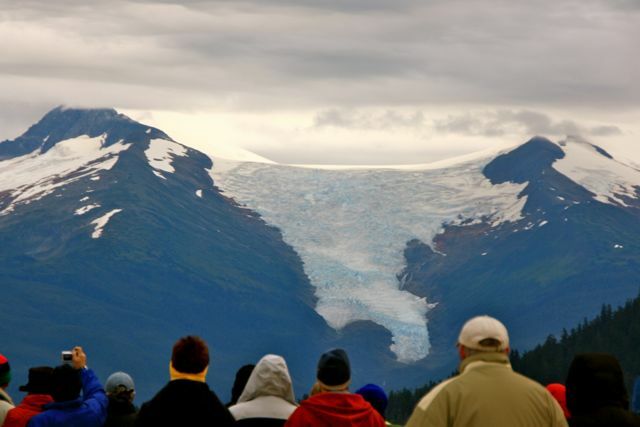 can you see the ice breaking off the glacier? 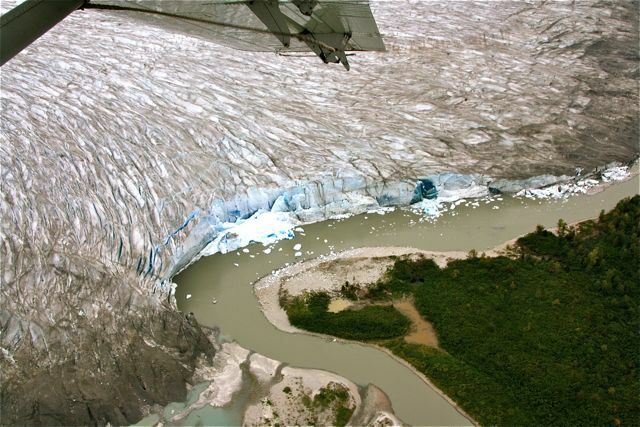 It is called glacier calving. 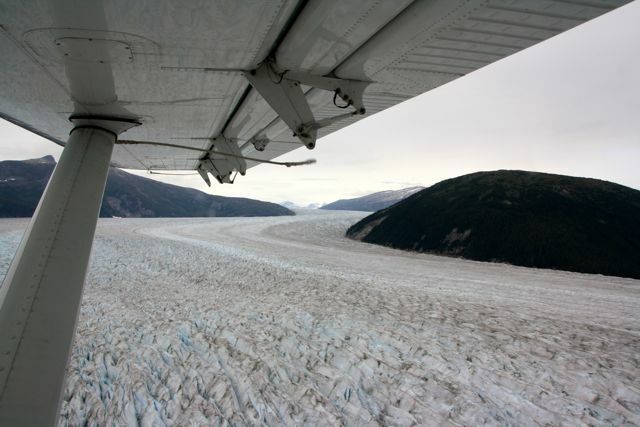 After 30 mins we landed in front of the Taku Glacier and taxied towards the Lodge. The lodge has a colourful history and too much to tell all here. 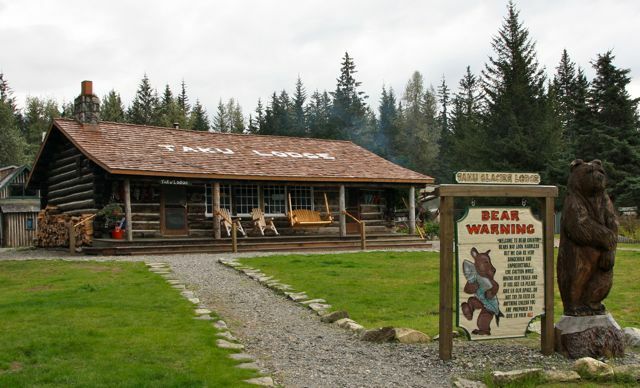 It was built in 1923 by a doctor from Juneau, who used it as a hunting holiday lodge. It has changed hands quite a few times but in 1934 it was inherited by Mary Joyce the family nurse of the owners. She was very adventurous and travelled overland by dog sled to Fairbanks, 1000 miles north. Temperatures got to 50* below. The sled is still in the lodge. In 1979 the owners at that time opened up the lodge to tourists they have since retired and a new family have taken over. There are many surrounding buildings/sheds/cabins dating back to 1930's. The view from our table in the lodge. 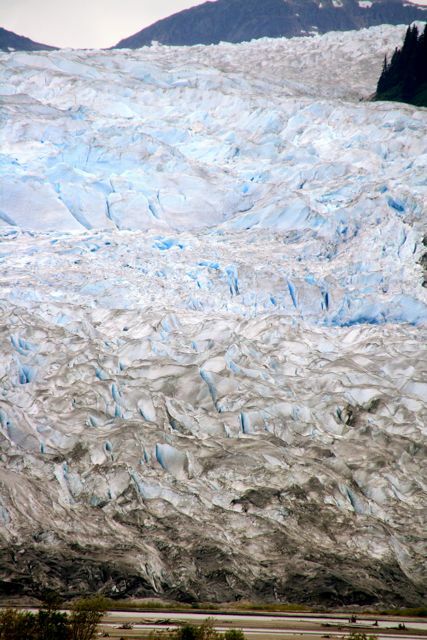 A close up of the face of the glacier. Tall isn't it? 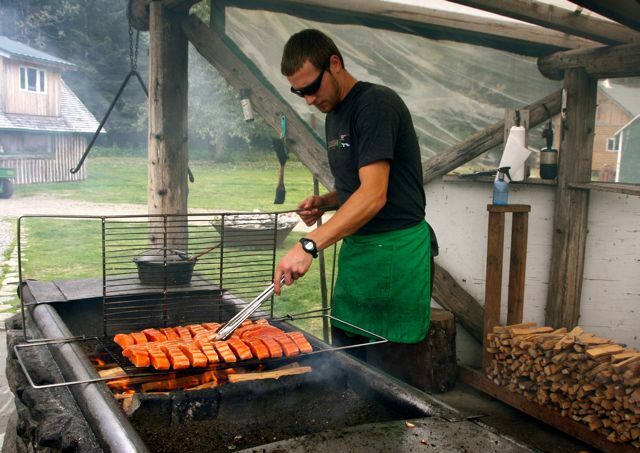 Our salmon being cooked outside on a BBQ. While we were inside devouring our salmon feast with salads, mexican beans, stewed apple and crusty bread, Mr Bear came to clean the BBQ plate. We left our sumptuous meal to run outside and click our cameras. He was big and beautiful. After the meal we were taken on a short walk through the forest. 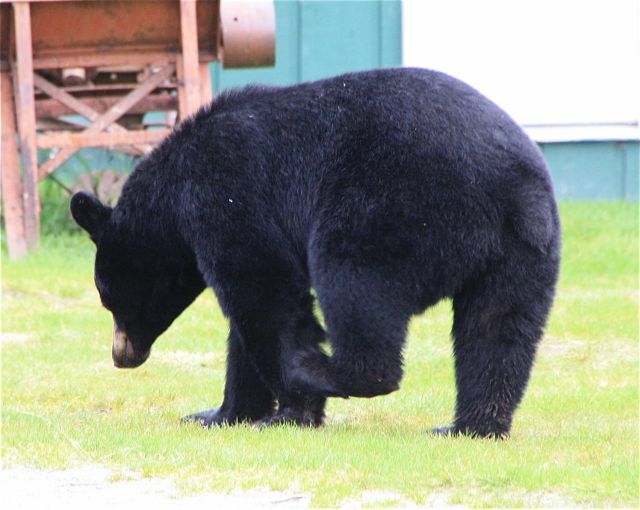 We had a local guide with a big stick to shoo away bears. 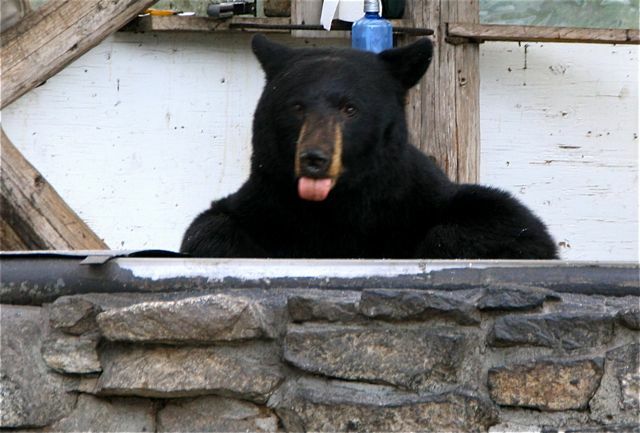 Black Bears are not aggressive like Grizzly Bears. 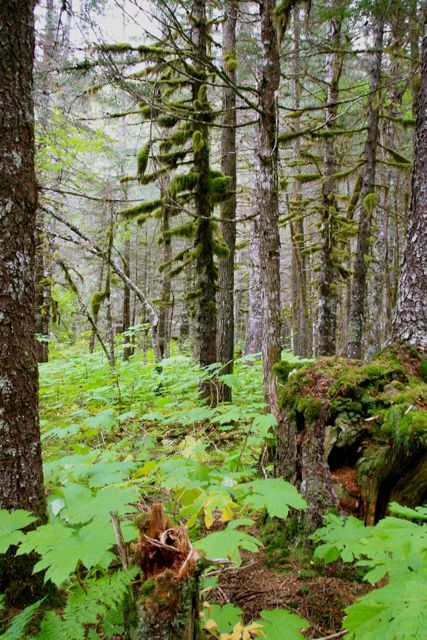 I was fascinated by the moss hanging in the trees. It is actually beneficial to the tree in that it helps the tree shed its lower limbs so that it can climb more easily up to the sun. After 2 wonderful hours the planes returned to pick us up. There were 5 plane loads. It is so exhilarating skimming across the water and effortlessly climbing into the air. 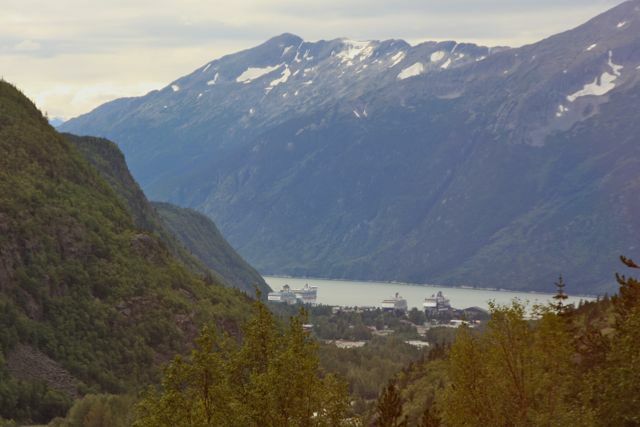 We followed the glaciers and rivers in between the soaring mountains back over the fjord and plopped down next to the ship. What a magic experience. 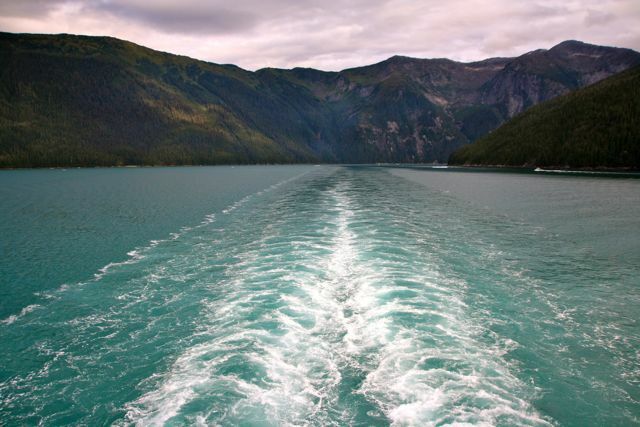 After leaving Vancouver we sailed all night and the next day towards Juneau. We explored the ship, I walked around and around the deck with Jill while Bill joined a computer course. later we met our friends in the Crows Nest Lounge for a trivia session. It was good to have a relaxing day after all the sight seeing we had done. That evening we had to dress in formal wear for dinner. It wasn't too posh thank goodness. The boys put on a tie and jacket and the girls a pretty top. By this time we had made good friends with Lyn and Barry from Wollongong, and Jill and Graeme from Sydney. We often had dinner together and solved the worlds problems. 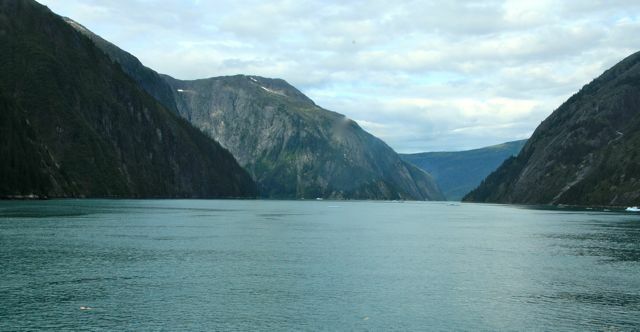 We were told to be up early and out onto the front deck the next day to see the ship navigating the narrow channel into Tracy Arm Fjord. It was freezing out there as we passed glaciers. Then we spied the narrow opening to the fjord. 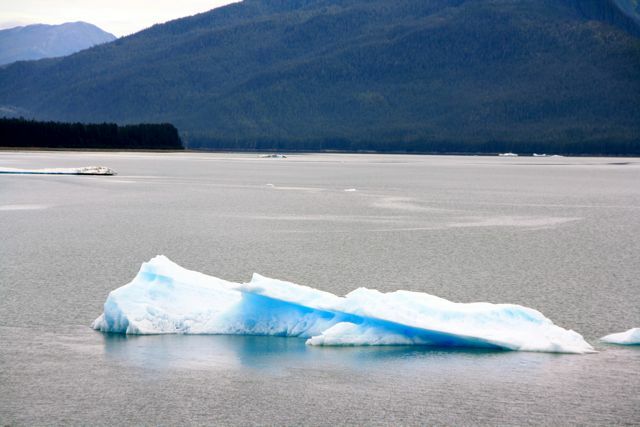 There were also icebergs floating in the entrance. They only looked small on top but who knows what is underneath. There was a catamaran in front of us which checked out the size of the icebergs to make sure it was safe for us to pass close by. Then we were inside the fjord. 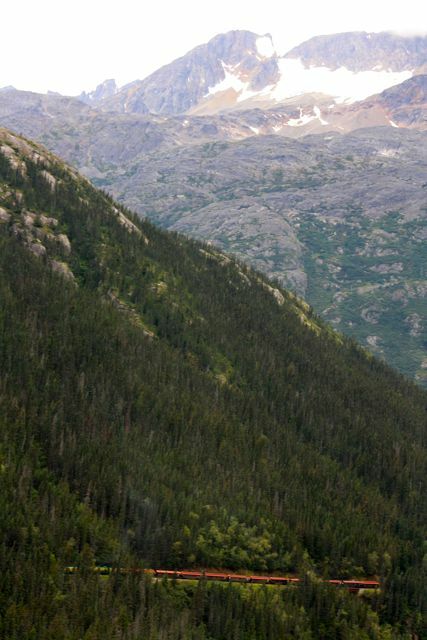 Some of the mountains reach 5000ft while the water is 1000ft deep. We weren't alone, a Princess Liner followed us in. 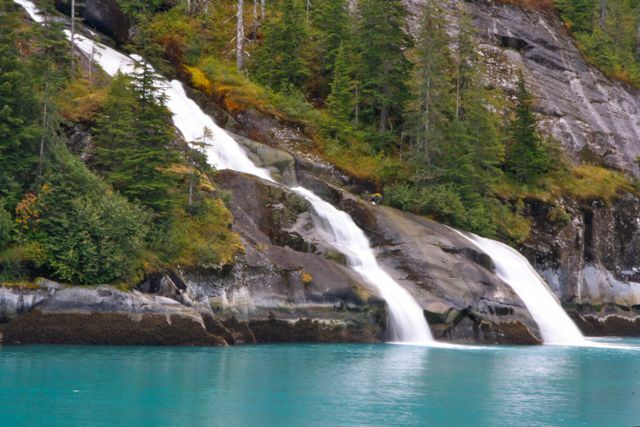 Occasionally waterfalls gushed into the fjord. 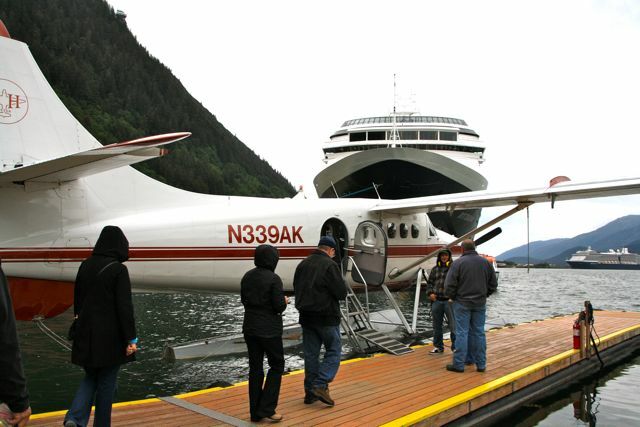 ....continued onto Juneau, where we were booked on an exciting shore excursion. So we toured western Canada by coach and train and now it was time to board the ship for Alaska. 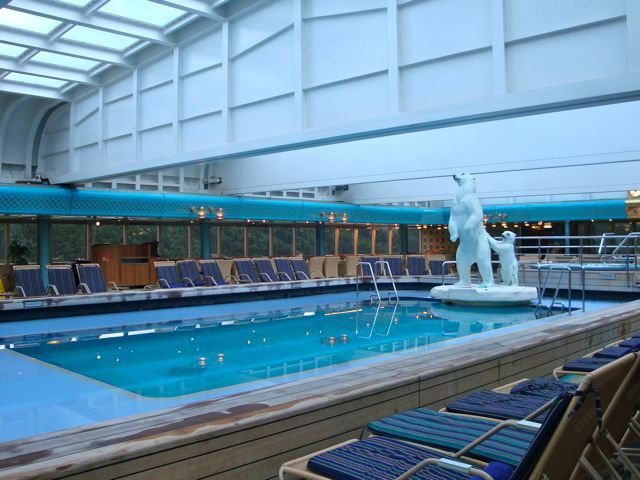 It was a mammoth exercise getting 2000 passengers on the ship within a few hours. Our tour guide organised us to be in the first groups to get on board. It was a busy time with luggage and US customs (fingerprints and photograph). Due to all that excitement I didn't get to take a photo of the ship. 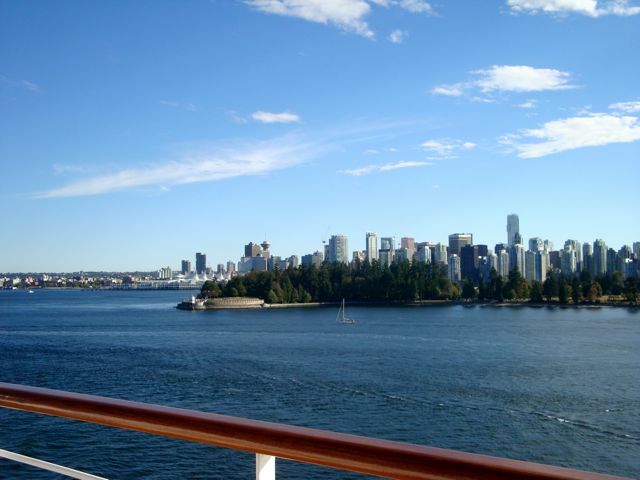 When we finally got to our cabin I managed to snap a pic of us leaving Vancouver harbour. 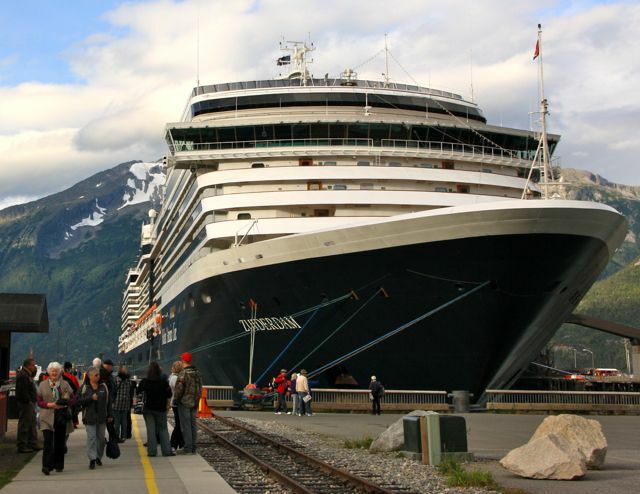 This is the ship, the Holland America's Zuiderdam docked in Skagway, Alaska. 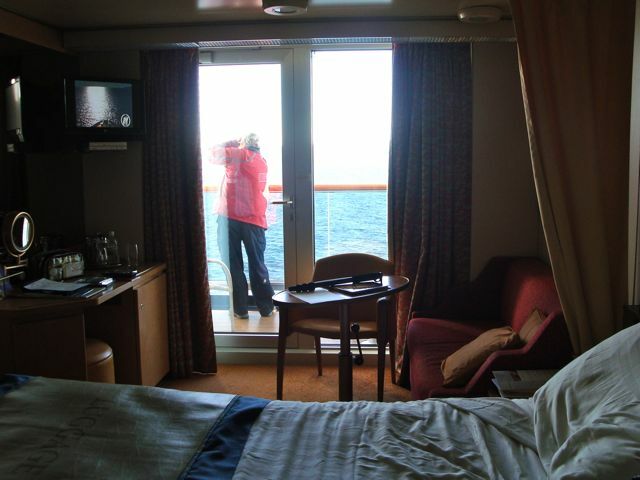 Our cabin with a veranda. 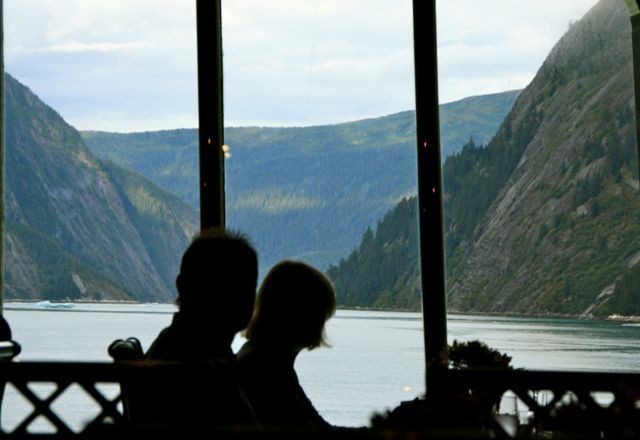 One of the dining rooms at the back of the ship with magic views changing every minute. 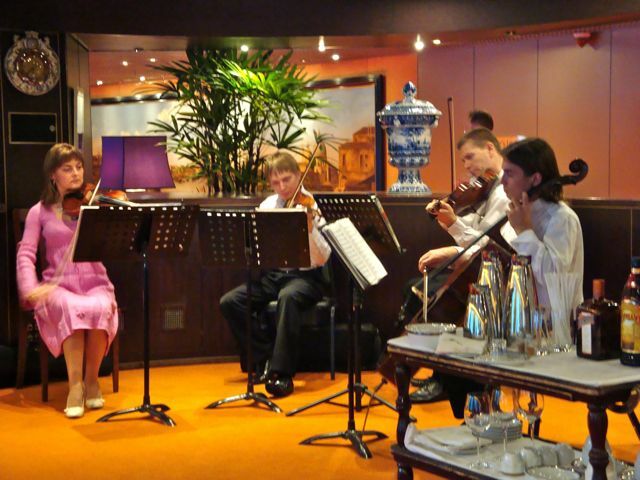 Before dinner our group of friends met in the Explorer's Lounge and listened to beautiful music. After dinner we took in a show. As it got cooler the roof over the pool was closed and the pool heated. We didn't have the urge to take off our clothes but many families and children did swim. 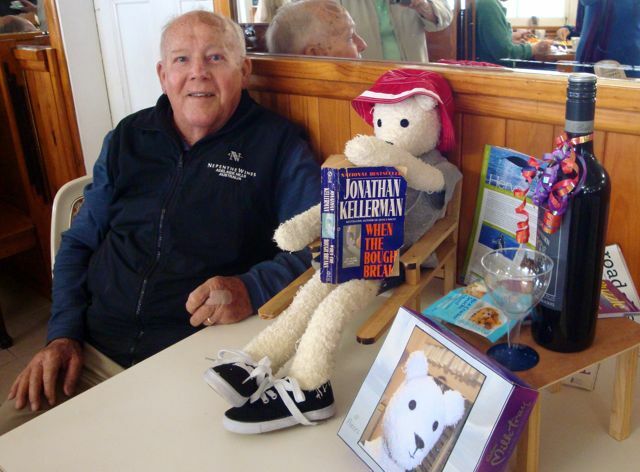 BIRTHDAY BEAR GOES TO THE BAY FOR LUNCH. 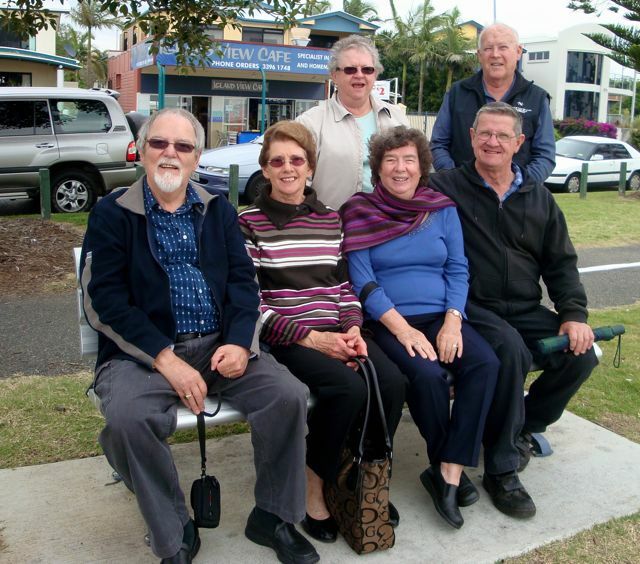 Our Birthday Bear Group went to Wynum on Moreton Bay for lunch to celebrate Paul's birthday. To understand the Birthday Bear's tradition click here. Bear was dressed by Mary and the table and chair were made by George. Bear is reflecting some of Paul's recent activities. He enjoys reading and is a whiz at jigsaw puzzles. He also enjoys a good red wine. I don't think we were quite ready for this shot by the looks of us, but at least it included Ann in the mirror taking the photo. (L to R) George, Helen, Paul, Mary, moi, and Bill. Unfortunately, Helen and Paul have not had a good year. 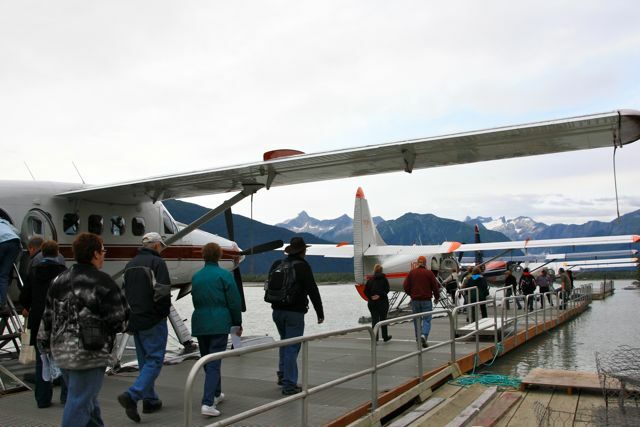 They often travel with us and they had booked to come to Canada and Alaska with us. However, Paul was diagnosed with Mesothelioma cancer and had to have surgery and chemotherapy. So they had to cancel their trip, we were all very sad. He has been a sick fellow and it is good to see he is able to join us today to celebrate his birthday. Since this day he has been given heartening news from the Oncologist. The treatment has worked and there are no more tumours growing. The weather was not nice enough for us to take our intended walk along the water's edge so we chatted and watched the bay activity. 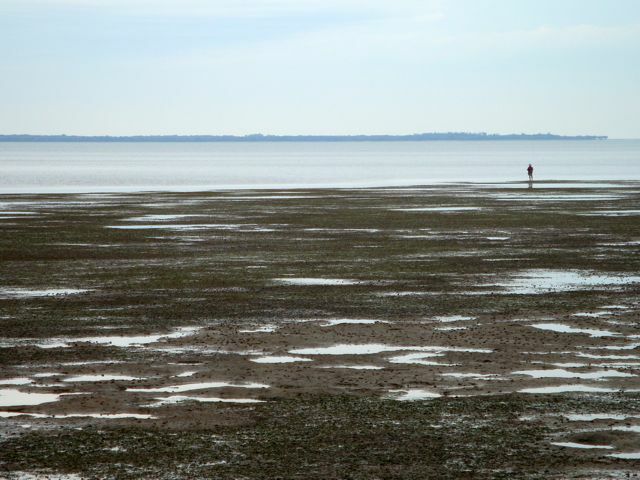 Its not a very pretty sight at low tide. The fisherman didn't seem to be catching anything either. After the train trip from Banff we were booked into The Fairmont Vancouver Hotel for 2 nights before we boarded the cruise ship for Alaska. 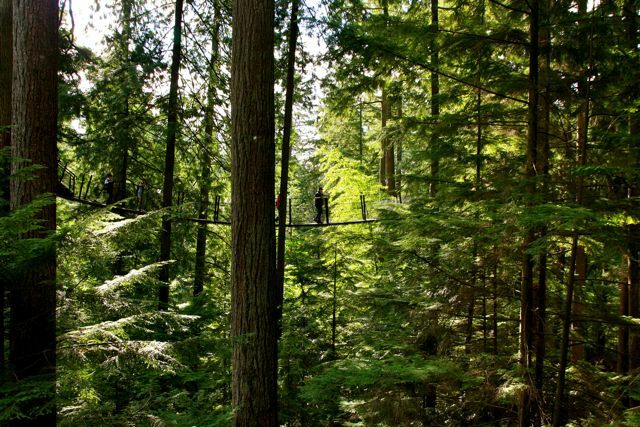 Our tour company had organised us an early morning private tour of The Capilano Suspension Bridge and Rainforest before the general public are allowed in. 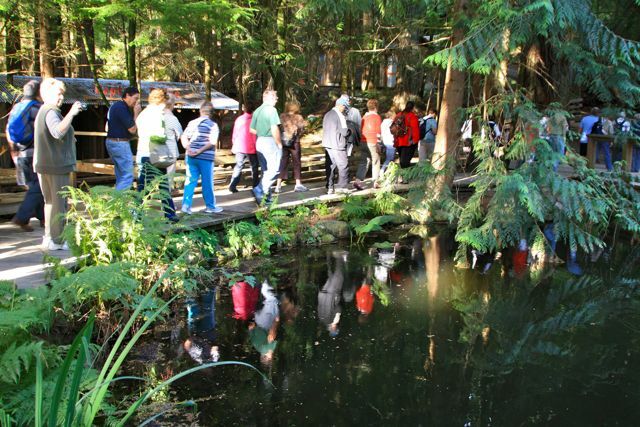 We set off for a walk through the beautiful forest. We climbed onto suspension bridges that swung between the trees up high. It was like being a bird. 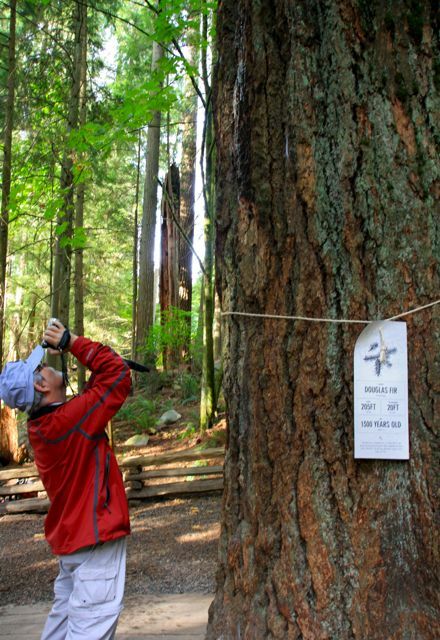 This giant Douglas Fir is 1300 years old and 205 feet tall. 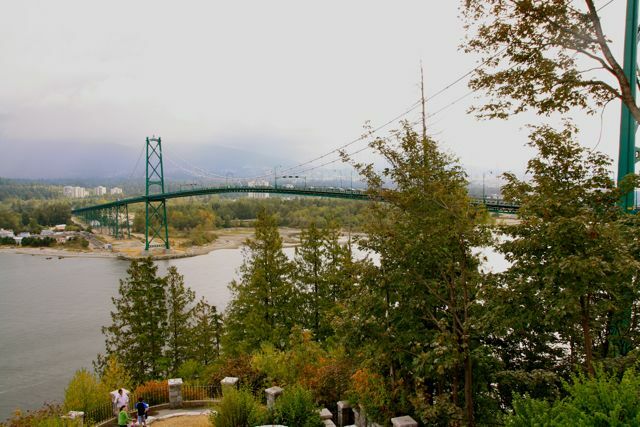 The Lion's Gate Bridge and Prospect Point. 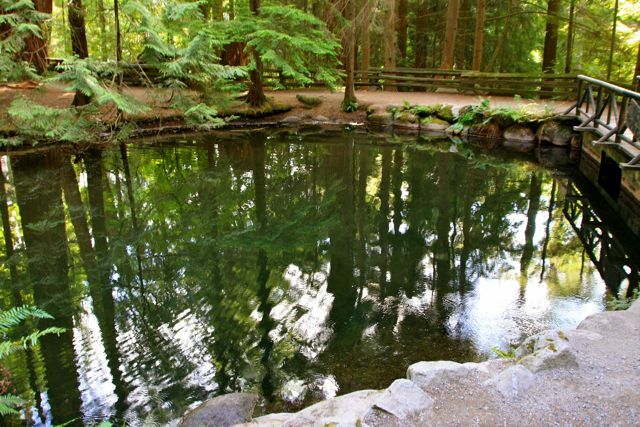 We drove around the beautiful Stanley Park but didn't venture out for a walk as it was raining. Then we were dropped at The Granville Markets, where we had lunch and the afternoon to ourselves. We returned to the hotel, where we had arranged to meet my cousin Molly, who lives in Gibson on the Sunshine Coast just north of Vancouver. We hadn't seen each other in 20 years. She was wonderful at her age 80+ in catching a ferry and a bus to come and see us for a few hours. I was so excited to see her and chat that I forgot to get a photo of us. I am so mad with myself! Labels: Canada and Alaska, Capilano Suspension Bridge, Vancouver.